In southern Italy, the Mafia wars are heating up. On Monday, Italy will deploy an expected 80 soldiers into the city of Reggio Calabria, on the toe of Italy's boot, to provide security for anti-Mafia prosecutors who have been repeatedly threatened by the powerful 'Ndrangheta criminal organization. The ramped-up precautions come after a campaign of escalating intimidation of public officials, which has included death threats, envelopes with bullets in them, a homemade bomb that blew up in the entrance to the courthouse in January and a package of dynamite that exploded outside a prosecutor's house in August. Last week, the threats ticked up another notch, when police responded to an anonymous phone call, in which a man's voice promised a "surprise" for Giuseppe Pignatone, the city's chief prosecutor. Outside the courthouse, under an abandoned mattress, lay an unloaded bazooka. Law-enforcement sources say that there's only one suspect behind the campaign: an angry, anxious Mafia, lashing out after a spate of high-profile arrests and the confiscation of well over $1 billion in illegal assets. "You can't afford to underestimate threats like this," says Pignatone. "But we will continue [our work]." Will the escalating tension explode into all-out war? Violent confrontation is out of character for the 'Ndrangheta, an efficient, tightly bound criminal organization that is estimated to control an annual turnover of more than $40 billion. "The 'Ndrangheta has never before challenged the state," says Antonio Nicaso, author of The Bad Weed, a book about the Calabrian criminal organization co-written with an Italian prosecutor. "It tries to infiltrate, but not to confront. 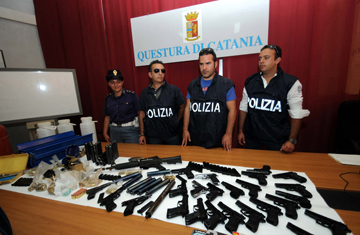 The strategy of the 'Ndrangheta has been to keep a low profile and make money." This may be changing, however. The 'Ndrangheta is tightly woven into the region around Reggio Calabria, penetrating nearly all aspects of politics and society. But until recently, it was left largely unmolested by local law enforcement. "Police left their guns in the office,' says Lirio Abbate, an Italian journalist and the author of The Mafia I Knew. Since the 2008 arrival of Pignatone, however, the pressure has been mounting. In July, an investigation led in part by Pignatone nabbed more than 300 suspected members of the 'Ndrangheta, including the man alleged to be the organization's top boss. According to Pignatone, the success of prosecutors is eroding the clan's grip on the region. That, in turn, has won them the confidence of the citizenry, whose cooperation is leading to further arrests. "This has never happened here before," says Pignatone. "Positive results are giving us even more positive results." According to Nicaso, the 'Ndrangheta's unprecedented acts of intimidation risk pulling down an even harsher reaction. Italy's anti-Mafia efforts have ebbed and flowed throughout the country's long struggle against organized crime, but the fiercest crackdowns have always followed episodes of violence. "The government and state reacts strongly when there is blood on the street," says Nicaso. The campaign of threats, he says, is likely the result of the removal of the organization's top leaders and the resulting power vacuum in which a new generation struggles for control. "It shows they are nervous," says Nicaso. And nervous gangsters may yet choose to lash out further. Even more worrying than the bazooka was the announcement last week by a Sicilian prosecutor that he had evidence of a secret summit, perhaps in September, between Italy's three biggest criminal organizations  the Calabrian 'Ndrangheta, the Sicilian Cosa Nostra and the Napolese Camorra. A similar meeting took place in the 1990s, when the Sicilian Mafia was waging war against the state; the 'Ndrangheta pointedly refused to participate. This time, according to an anonymous tip received by prosecutors, the three groups are said to have agreed on a potential hit list. The men whose deaths were discussed reportedly included a journalist as well as prosecutors in Sicily and southern Italy, including Pignatone. To be sure, the conflict in Reggio Calabria is still far from reaching the levels seen in Sicily in the early 1990s, when 150,000 soldiers poured into the island following the murder of two leading anti-Mafia judges. But, says Abbate, who lives under police protection after his writings drew threats to his life, the summit shows that the 'Ndrangheta may be deciding to act. "If the Mafia is going to decide to kill a prosecutor or a journalist, then the repercussions are going to be huge," he says. "It makes sense that they'd want to make the decision together."